RIC Report on Michael Collins Michael Collins devoted his life to fighting military and political campaigns against the British to gain independence and Home Rule for Ireland. He rose to a high standing within the Irish nationalist organisation Sinn Fein and became President of the Irish Republican Brotherhood until his assassination in August 1922. 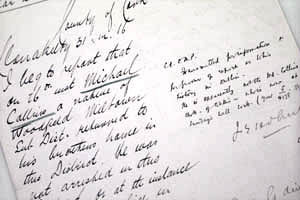 On 7th April 1919 at around midnight, Collins was smuggled into the documents room at Dublin Castle. It was there that he read the top secret files of the RIC including his own personal file (on display here). He apparently burst into laughter after reading in the file that his family were "brainy" people.